NEW YORK, NY (Mar. 3, 2011) – Yesterday’s media conference call featured Middleweight Champion, Sergio “Maravilla” Martinez in advance of his “Diamond Elite” clash with WBO Jr. Middleweight Champion, Sergiy “Razor” Dzinziruk on March 12 from the MGM Grand Theater at Foxwoods, airing live on HBO World Championship Boxing. Also on the call were Martinez’ advisor Sampson Lewkowicz, and Lou DiBella, the promoter of the event. “Gabriel apologizes. He couldn’t be here today and in fact he’s training Javier Fortuna right now, who will also be on the undercard. Victor Cayo, he’s training him now, as well as Victor Gonzalez. Again, he apologizes for not being on this conference call. It’s very important to him but all he needs to say is his fighter, Sergio Martinez, is having the best training camp and one of the hardest training camps. In fact, he is hitting harder today than his last fight against Paul Williams. He is guaranteeing a knockout. He is very excited about this fight and he isn’t taking Dzinziruk lightly at all. “I want to point out that, even since our call (on Tues., Mar. 1), tickets are moving very, very well at Foxwoods. I’m urging people to get their tickets as quickly as possible, particularly at lower price ranges because those are moving very quickly and there are still some great ringside seats available. But I’m very, very happy with the performance of the event at the site and I think we’re going to have a great crowd at the MGM Grand Theater at Foxwoods. As everyone knows it’s going to be televised by HBO Sports and Andy Lee and Craig McEwan are in the opening fight. “The fact that this fight is happening is a tribute to the type of champion Sergio Martinez is. In a lot of ways this is a no-win fight: this is the best fighter in the world, Dzinziruk, that no one knows. He is a very difficult guy to fight because of his defensive style, because of his great jab, his movement, and he’s a very well skilled guy. He’s really unknown in this country, but this is the fight HBO wanted. They wanted Sergio in a difficult match-up and it’s typically Sergio Martinez’ way. Sergio said, ‘Put him in front of me and I’m going to fight him,’ and he is. He is the boss and that’s why he’s become the ‘People’s Champion.’ He lost his WBC title and he’s now fighting for the Diamond title. Honestly, he’s doing that because he’s fighting the best and this is why he has captured the imaginations of so many boxing fans and why everybody is looking forward to March 12th to see this fighter and what he brings. “Obviously, Sergio is looking for the biggest fights possible. We pursued the possibilities with Cotto and had conversations with Arum but the fight didn’t materialize. He (Arum) wasn’t interested in reaching out beyond his stable. But this is the most difficult fight; this is the toughest fighter out there. 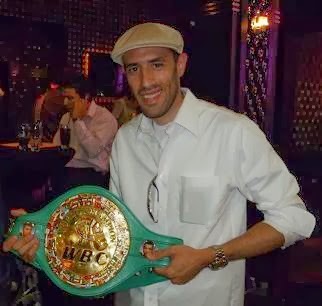 I said it’s a no-win situation, but if Sergio knocks this guy out at least intelligent people in boxing and the people who’ve seen Dzinziruk fight will know what an accomplishment it is. Tickets for “Diamond Elite: Martinez vs. Dzinziruk” are priced at $450, $250, $125, $75, and $50, and are available now through the MGM Grand Theater at Foxwoods box office. Tickets can be purchased online at www.mgmatfoxwoods.com, by calling the box office at 1-866-646-0609, or in person at the MGM Grand at Foxwoods box office.